As 2017 draws to a close, we at Mary’s Pence are reflecting not just on this year, but on 30 years of funding women and changing lives. For 9 of those thirty years, we have worked with the women of the Concertación de Mujeres de Suchitoto in El Salvador through our ESPERA Community Lending program. We are grateful for the following words of encouragement from the Concerta during this time of celebration. Your sisters of the Concertación of Suchito hope that you all are well and full of life’s energy. Thirty years ago your rebellion in the face of the church’s traditional collection of monies for the poor has served in making visible women’s dreams. Our voices are strong, our priorities and actions clear in the struggle for a new justice. We celebrate our sisterhood with Mary’s Pence throughout these 30 years and across national boundaries. In our case, Suchitoto is a region continuing to develop its identity and strength after years of armed conflict. In our work to participate in the renovation of place and identity, we have been blessed to form a sisterhood with Mary’s Pence. The Concertacion de Mujeres has been accompanying women who are survivors of violence. After the war we received a unique response for economic development with the ESPERA FUND which began here in Suchitoto and continues to be shaped by our partnership with May’s Pence. This work would not have been possible without the dedication of Gilda, Katherine, the ESPERA team, Mary’s Pence Staff, the board and other compañeras like Sister Pat Rogucki and many more. We appreciate and are grateful for the vision and the strength of Mary’s Pence. Your organization has come into bloom with 30 years of dedication and commitment. Since 1991, the Contertacion de Mujeres has been dedicated to the “acompanimiento” of women confronting violence. For over 25 years we have sustained our organization. We know in our very bodies how difficult it is to give birth to an organization and evolve with it. We believe we have been faithful to the energies of life itself, integrating and creating new forms in the struggle for women’s leadership and participation in social change. The Concerta thanks Mary’s Pence, our first partner to help develop a program offering groups of women the possibility, in the form of loans, to manage their money, to develop their work, their businesses and dreams. For your faithful “acompanamiento” in our journey to autonomy, we will be ever grateful. 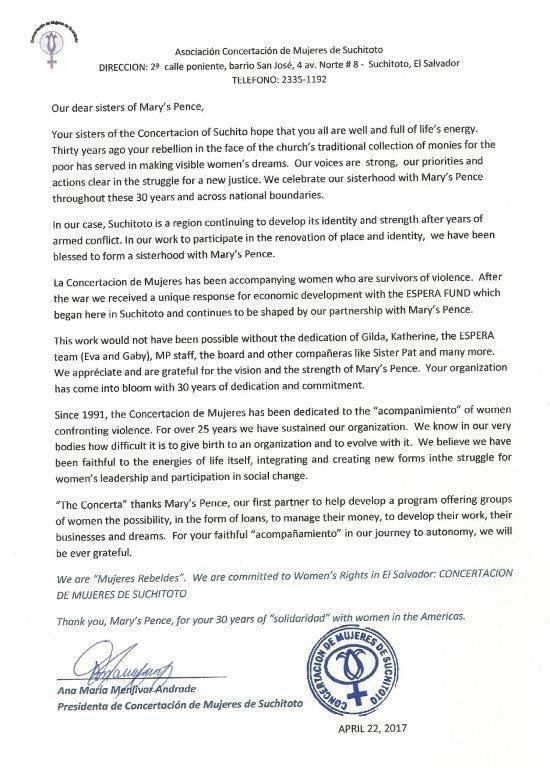 Thank you, Mary’s Pence, for your 30 years of “solidaridad” with women in the Americas.